We have been avoiding writing about Barnby’s frescoes for the Donners Brebner building because we know so little about them. They were commissioned by Sir Magnus Donners, completed about 1928, and received “a great deal of public attention.” [AW 31/24, CCR 14/9] Now that we are reminded that they were destroyed by a direct hit on building in the Blitz, we will provide some historical and geographical background that helps us better imagine Powell’s creations [SA 8/5. MP 118 /113]. Millbank runs along the Thames south of Westminster to Vauxhall bridge; the Albert Embankment runs along the opposite side of the river. Both Millbank and the Albert Embankment sustained multiple bomb hits during the Blitz. After reading about Blitz damage in this part of London, we have reached a dead end in our search for Barnby’s frescoes. For example, the Tate Museum, now called the Tate Britain, was built in Millbank near the Vauxhall bridge late in the nineteenth century on the sight of an infamous penitentiary. The Tate sustained a direct hit, and damage to the building is still visible, yet no art was damaged. The lobby of the building was designed by Richard Atkinson with bas relief sculptures by Eric Aumonier. Frescoes, by Barnby or others, are absent. We have no idea if our speculations and digressions have anything to do with Barnby’s frescoes. We welcome insights from our readers. The Gunpowder Plot of 1605 was an attempt by Guy Fawkes and others to blow up the Houses of Parliament. The failure of the plot is still celebrated in Britain by bonfires and fireworks as Guy Fawkes Night every November 5. The engraving above includes the only known contemporary portrait of Fawkes. His name appears above the third figure from the right; “Guy” becomes “Guido” in Latin. The artist is Crispijn de Passe the Elder (~1565-1637), a Dutch engraver who worked through a London publisher and bookseller to sell his prints in Britain. Powell might well have been familiar with this engraving because from 1962 to 1976 he was a trustee of the National Portrait Gallery, which has a number of portraits of him. As he did in A Question of Upbringing (see QU 214/221, Le Bas’ Appearance), Powell here evokes impressions of Ancient Egyptian imagery more than references to particular works. Below is a sculpture of the Pharaoh Ramses II “shielded from human approach” by the gods Ptah (left) and Sekhmet (right). Colonel Hogbourne-Johnson as the god Horus was easy to envision, though not as an owl, as Nick has it, but as a falcon, bad-tempered to be sure. Here is Horus as he is depicted at the Temple at Edfu from the first couple of centuries B.C. The identities of Egyptian deities is not constant over the long evolution of the Egyptian pantheon, but Horus is generally known as the son of Isis and the rival of Set, slayer of Osiris, Horus’ father, or sometimes brother. Horus is also identified with the sun and the moon, and Pharaoh himself came to be identified with Horus while alive, then as Osiris after death. The Horus at Edfu, judging from his fierce expression, might easily be a colonel who aspires to become a general as soon as possible. Anubis, shown above, was the jackal-headed god who was associated, as Nick suggests, with mummification of the dead and supervision of souls into the afterlife. Colonel Pedlar as a mild-faced Anubis came readily to mind when we saw this Anubis in the Vatican collection. It is from the Roman period late in Egypt’s history and is actually a blend of Anubis and the Greek god Hermes. We liked how this more doggy Anubis sports military braids and medals and looks as if he would be right at home at General Liddament’s mess. We are unsure of the identity of “Our Artist,” but perhaps this a reference to The Hudson River School, a group of nineteenth century American painters who presented a dramantic yet realistic vision of American landscape. Thomas Cole (1801-1848) was born in Britain but moved to America, where he founded the movement; Cole wrote: “There is one season when the American forest surpasses all in the world in gorgeousness — that is the autumnal; — then every hill and dale is riant in the luxury of colour — every hue is there, from the liveliest green to the deepest purple from the most golden yellow to the intensest crimson. ” [“Essay on American Scenery” The American Monthly Magazine 1 (January, 1839)] We show a work by Thomas Worthington Whittredge (1820-1910 ), a later member of the Hudson River School, to illustrate how varied those hues can be. 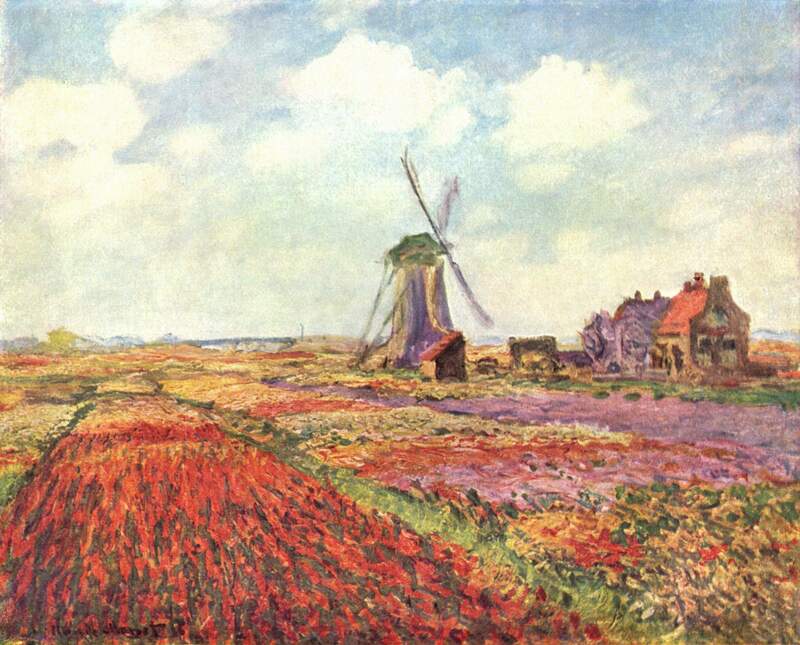 Speaking of tulips fields, the colors of the bed that dominates the lower left of Monet’s canvas shown here might be compared to a ruddy cheek, but our idea of Lord Bridgnorth’s complexion is actually clearer from reading Powell’s words than from seeing the candidate image. Of course, we do not know exactly where on the hot part of the spectrum Lord Bridgenorth glowered, but Powell rather economically uses the visual allusions to convey this emotional heat. Overcome by the beautiful color, Bergotte slumps dead in front of the painting. Critics debate exactly which dab of yellow in this painting killed Bergotte and how this passage reflects Proust’s own emotional response to the painting. In The Military Philosophers, Jenkins reflects on Proust, which will give us a chance to return to the Powell-Proust nexus. In our QA post Wilson and Greuze at the Jeavons’s we offered a pastel of a domestic scene in Marrakesh by Zinaida Serebriakova, from 1928, as a likely example of what the Jeavons’s might have collected. Continued searching strengthens our hunch that Serebriakova’s work might indeed have turned up in the heterogeneous Jeavons collection. Zinaida Serebriakova (Russian, 1884-1967) is celebrated as one of the first female painters of the early Modernist period, though her most famous works retain a classical rather than revolutionary nature. Serebriakova made many pictures of her travels in Morocco, though none, alas, are captioned Rainy Day at Marrakesh. Indeed, Marrakesh’s scant annual rainfall insures that few rainy views are likely to turn up in any artist’s oeuvre, but a watercolor of Marrakesh by Serebriakova suggests at least a touch of rain might be predicted, judging from that sky. The storage of the Wilson and Greuze in a safe location before the bombing is an example of a more general preservation of art in British collections by removal early in the War from London to protected sites in the country side.